Slate Run Metro Park is a beautiful 1700+ acre park in Pickaway County with a variety of habitats including forest and grasslands. An intermittent stream, Slate Run Creek, runs through the woods. Its shale and soil banks provide good substrate for mosses. 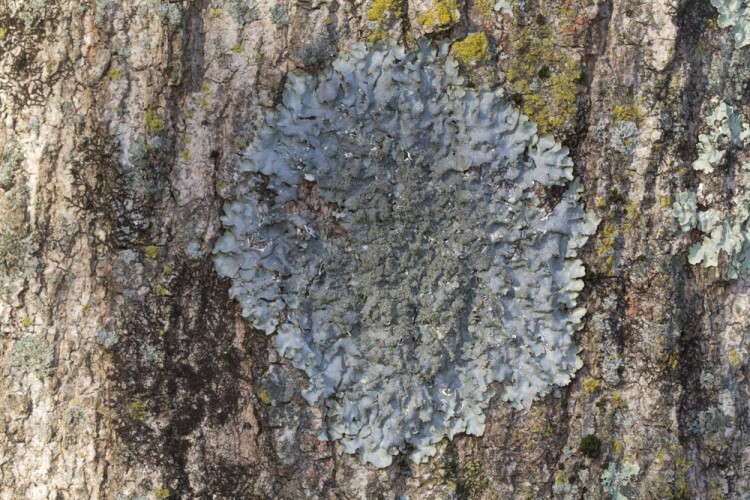 Trees on the edges of the forest and also scattered in the sunny recreational park area are the principal lichen substrates. Over a dozen OMLA members and friends came to explore the park on this lovely late Spring Saturday. Happy moss and lichen hunters at Slate Run Metro park. Boulders in the woods are a good place to find mosses. Janet and Suzanne discover something small and green. 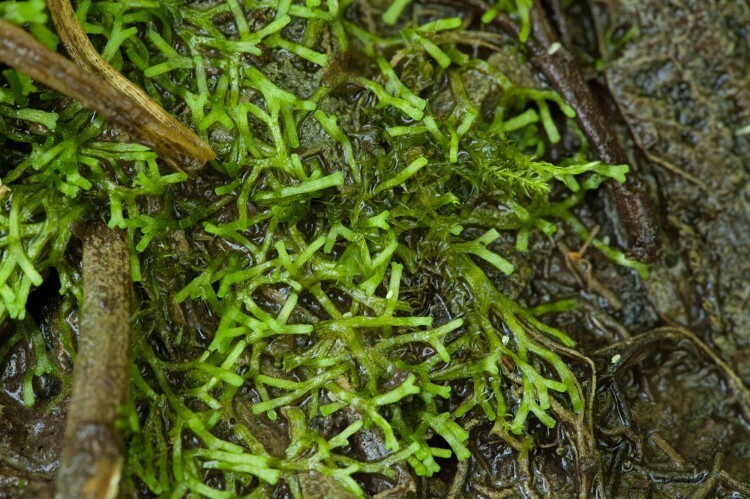 Members of the moss genus Orthotrichum are tufted dark green cushion mosses. Different species are typically found either on bark or rocks. 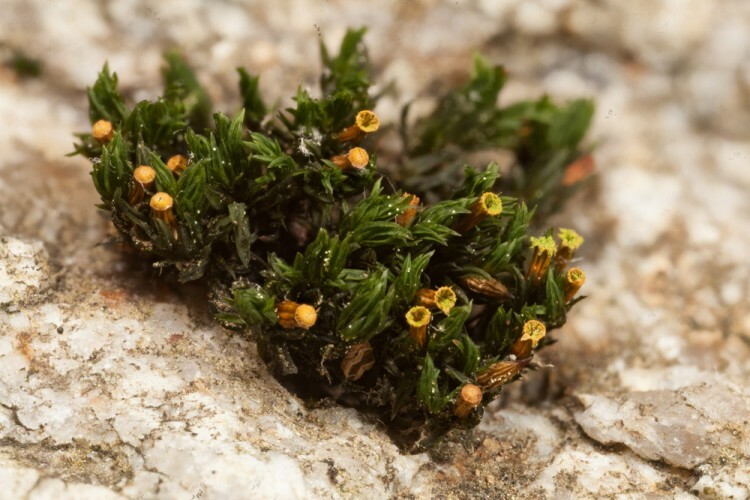 The sporophytes are short, and their bases are closely surrounded by the upper leaves. The peristome is in one series, consisting of of 8 (sometimes splitting into 16) triangular, sharply reflexed teeth. Soil on the bluffs of the banks of the intermittent stream were fairly well occupied with mosses. 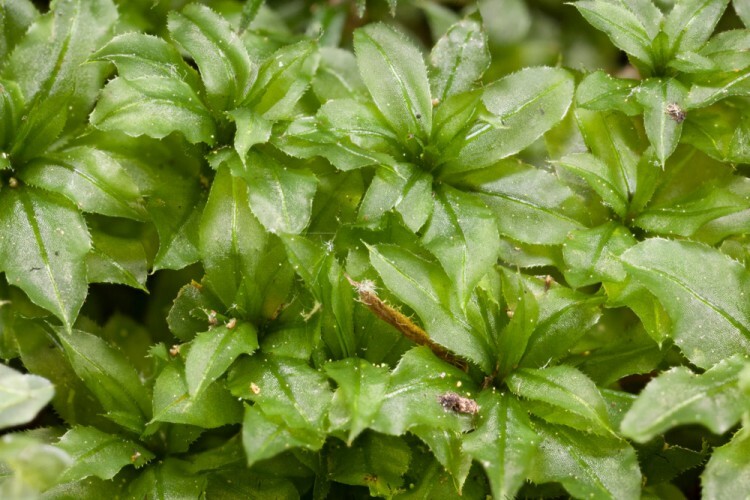 One of these is a robust cushion moss (acrocarp) with fairly broad leaves that are toothed all around the margin. It’s Plagiomnium ciliare. Plagiomnium ciliare has elliptical leaves that are finely toothed all around. 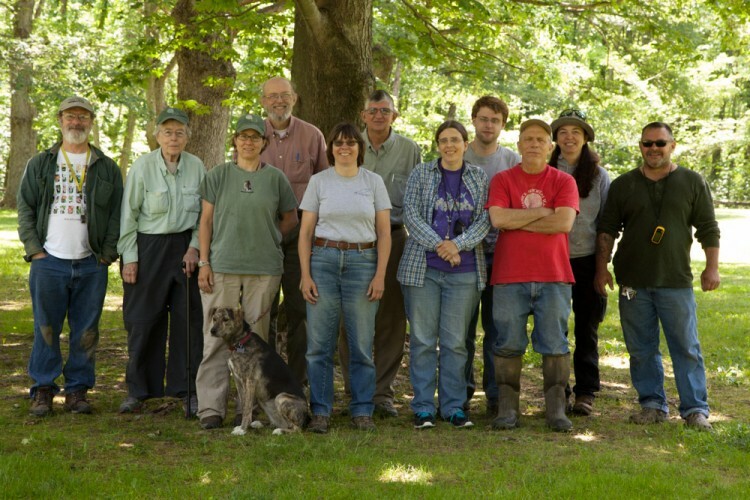 Trees constitute the best lichen substrate in wooded areas free of large expanses of boulders or open bluffs. 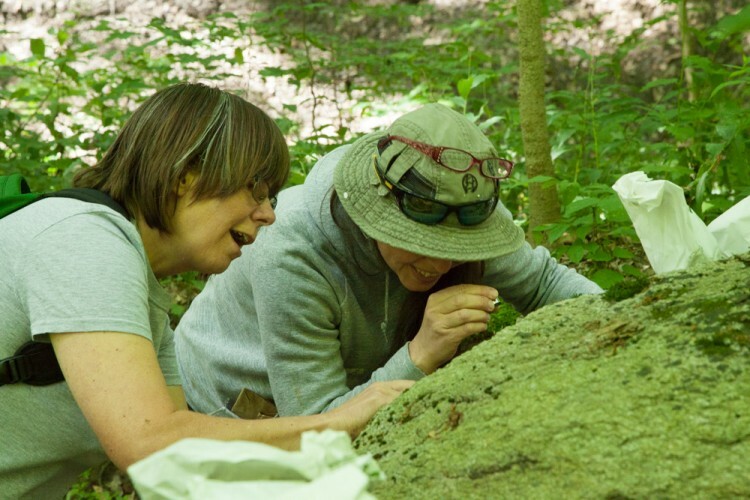 Here, Diane and Janet watch as Ray scrutinizes bark. 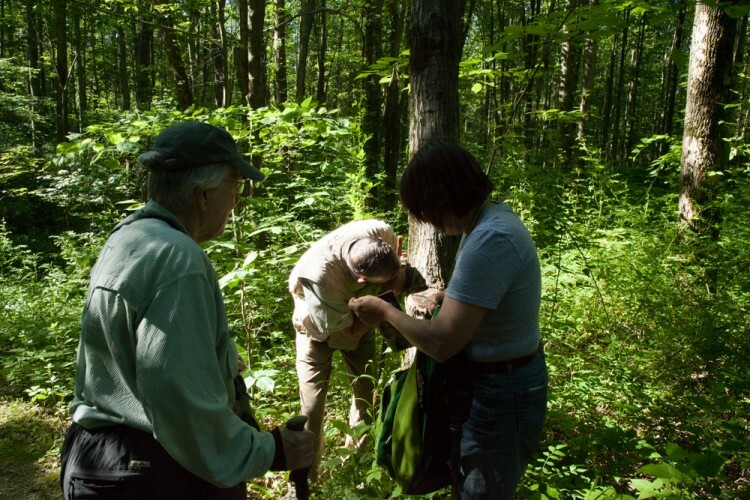 Ray examines bark for lichens. 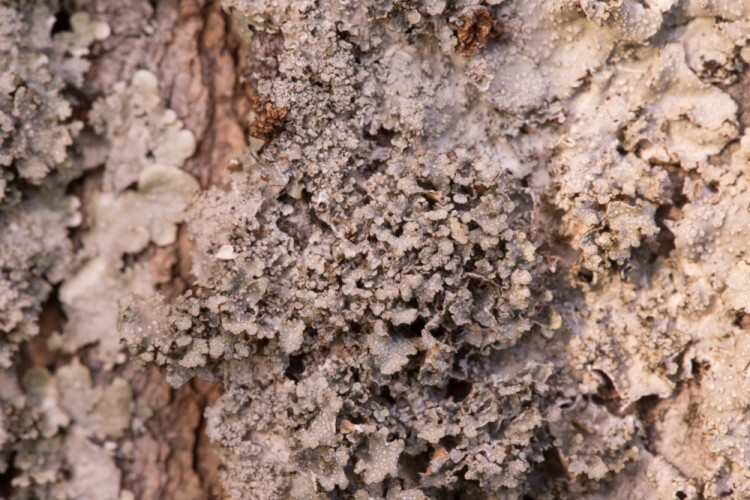 Members of foliose lichen genus Punctelia are frequently encountered on trees in Ohio. One species is especially common: Punctelia rudecta, which is gray, with moderate-sized marginal lobes, and prominent isidia (minute projecting asexual reproductive structures). Punctelia rudecta is a moderate-size gray foliose lichen. A related species that lacks either isidia or soredia is Puctelia bolliana. Note the lobulate thallus. Punctelia bolliana is a foliose lichen with conspicuous lobules. Way in the woods (a little bushwhacking here) lies an amazing little buttonbush swamp. It was pretty squishy walking aroind here, but worth the trouble. 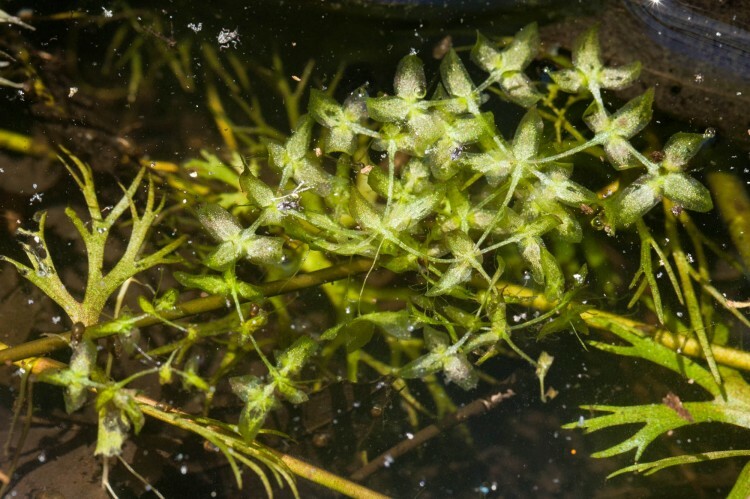 We saw this tangle mass of little straps-shaped leaves belonging to an aquatic liverwort, Riccia fluitans. This species is very common in home aquariums. It’s nice to see it in the wild. Riccia fluitans is an aquatic liverwort. In the same swampy spot in the woods, this is not a bryophyte but a vascular plant that seems to be trying very hard to be one. We saw “star duckweed,” Lemna trisulca. This crazy duckweed, looks like little airplanes crashing into one another. Star duckweed looks like a crowded airport from above. OMLA members are good friends, always happy to talk about life, the universe, and everything. Usually this consists of updating one another on their recent outings in search of mosses and lichens. 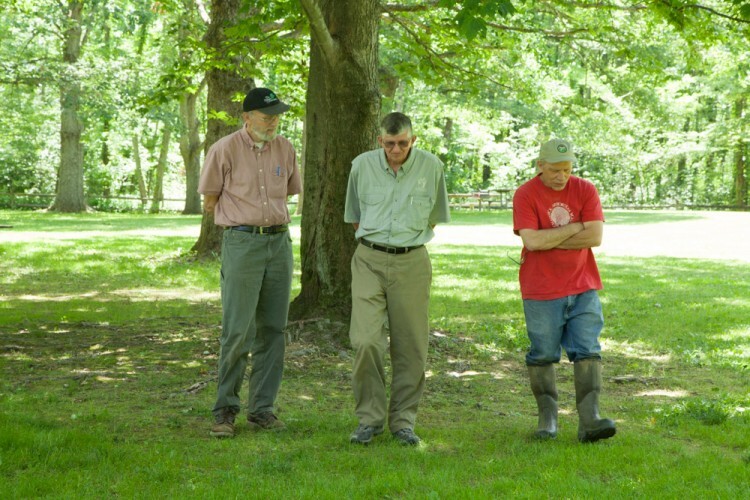 Jim, Ray and Bill discussing their recent experiences hunting mosses and lichens. For further information about this very excellentent foray, including moss and lichen species lists, look in the 2014 volume of the association’s newsletter, OBELISK.